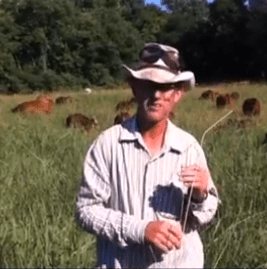 This morning at Green Pastures Farm, Greg talks about his Eastern gamagrass pasture. This is a good hot weather forage, though it doesn’t hold up well for winter stockpile. 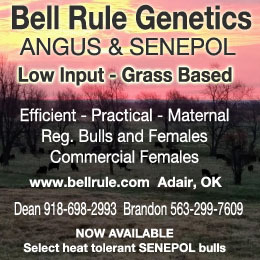 He has 240 head on this 1.5 – 2 acre pasture, or about 75,000 to 100,000 pounds per acre. He moves the herd twice a day, ensuring that they only graze the tops of the grass. He’s found this to the best way to graze because it helps maintain forage for his animals even in drought. 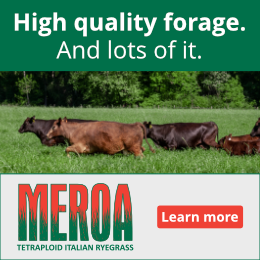 As you watch the video you’ll be able to get a better idea of his cattle and the pasture quality. He’ll also share how often he moves the cattle. 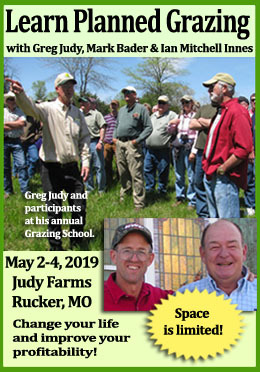 Green Pastures Farm raises South Poll cattle. His herd has the genetics to grow and finish on grass. Here he shows one of his bulls, a steer and a cow and describes their attributes and how their breeding program focuses on animals that will do well in his operation. The Judys also raise pastured pigs. These Berkshire hogs have no flies and are very clean because they’re moved from pasture to pasture. Enjoy! Hey Greg- I like the videos! I have a question – True to your predictions of increased biodiversity after third year, I now have (among several other newbies) two solid patches of Johnson Grass in one paddock. At a distance they look like large square bales, ie very dense and about 5 ft high, probably rhizomatous. I never saw it before. I like the idea of a new warm season forage, but worry about its reputation as a vicious invader. Probably herbicide resistant, so I suspect grazing will be best way to control it, but also might spread it? ?